Bengaluru, Karnataka, India: One of the leading real estate developers in the country, RMZ Corp. has announced a strategic partnership with Hyderabad’s largest business house, My Home Group to develop premium commercial office spaces in the city with an investment of over $ 1 billion. Spread across 10 million sq. ft. the office space project will be jointly developed and managed by RMZ Corp. and My Home Group. The first phase of this extensive project covering 3.5 million sq. ft. is already underway at Silicon Valley of Hyderabad with close proximity to HITEC City, the hub of IT & ITES companies. This commercial property will be known as THE SKYVIEW and is expected to be delivered by December 2018. “As the economy continues on an upswing, we remain committed to pursuing assets to enhance RMZ’s portfolio, income stability and lease profile. We invest in properties located in economically strong locations that offer an opportunity for value appreciation,” he added. Mr. Rameswar Rao, Chairman My Home Group, said, “My Home Group enjoys a clear Brand leadership in the construction space of Hyderabad- both in the residential & commercial segments. With increased focus on technology adoption and business expansion in Telangana, Hyderabad with its latest tag of “The best Indian city to live in” opens up greater opportunities in office space development. “This venture is in sync with Cabinet Minister for IT E&C, Mr. KT Rama Rao’s aim to nurture a progressive and disruptive Hyderabad, making Telangana an investment destination,” he added. RMZ Corp is one of the leading owners, developers, operators and fund managers with an unmatched portfolio of world-class commercial real estate space in India. Over a decade since inception in 2002, RMZ currently holds prolific portfolio of over 20MSft under ownership & $ 4B of Assets under Management creating a portfolio of rent-yielding commercial assets in India. Establishing partnerships with marquee investors, including the Qatar Investment Authority, has helped fuel RMZ's significant growth potential. The organization has a remarkable vision and an aggressive expansion plan of 60 million square feet of assets under ownership by 2020. Headquartered in Bangalore, RMZ Corp has continued to grow through new markets, partnerships and capabilities as well as through its development of high-profile office, mixed-use and luxury residential projects. RMZ holds premium office space across Bangalore, Mumbai, New Delhi, Hyderabad, Chennai and Pune. Many of the world’s most prestigious conglomerates rely on RMZ Corp to meet their space requirements. Providing leadership in thought and action was always textured into the group’s value system. RMZ Foundation was established to promote the well-being of humanity throughout the country. To achieve these goals, the Foundation works at the intersection of four focus areas—advance education, revalue ecosystems, secure livelihoods and transform urban development. RMZ Art Foundation (RAF), is a non-profit foundation creating opportunities for emerging and established artists, facilitating artistic exchange and developing creative practice through residencies and partnerships. RAF will create Art Walks, Art Galleries at our urban assets and build on initiatives for students and emerging artists across major cities in India. Headquartered in Hyderabad, My Home Group is one of the largest and diversified business conglomerates from Telangana with interests in Construction, Cement, Power and Education businesses with a total workforce of over 5000 employees and a strong legacy of over 3 decades of serving customers across segments and geographies in the country. Charting a steady growth path of expansion and diversification, the group is one of the least leveraged with expansions being mostly funded from internal accruals. The group is highly recognized for its strict adherence to quality in products and services and the highest standards of corporate governance and business ethics. Since its inception in the year 1981, My Home Constructions Pvt. Ltd. (MHCPL) has created a new idiom in the art and craft of construction in the state of Telangana. Dotting the skyline of Hyderabad city, its projects have the best quality and a unique aesthetic appeal. MHCPL has built and delivered as many as 16 residential & commercial projects with a total built-up area of more than 10 million Sft. Currently over 19 million Sft is under construction and tens of millions Sft is under planning stage. The Group’s foray into the cement sector with My Home Industries (P) Ltd. (MHIPL), a 50:50 joint venture with CRH PLC; a global leader in building materials with the flagship brand “Maha Cement”. MHIPL has three ISO 9001:2008 certified factories located at Nalgonda (Telangana), Kurnool (AP), Vishakhapatnam (AP) and with the recent Tuticorin grinding unit (TN) the total capacity has gone up to 10 million tons per annum. My Home Power & Consultancy is a strategic arm of the group focused on providing tailor made power solutions. Founded by visionary and philanthropist, Dr. Rameshwar Rao Jupally the group is looked upon and respected for being a value-based organization. 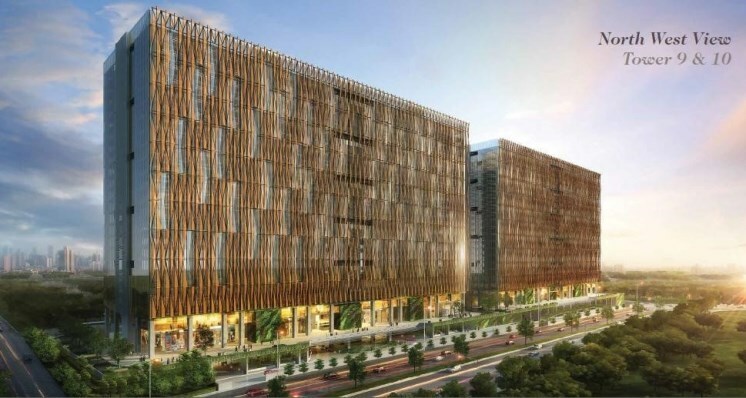 One of the leading real estate developers in the country, RMZ Corp. has announced a strategic partnership with Hyderabad’s largest business house, My Home Group to develop premium commercial office spaces in the city with an investment of over $ 1 billion.